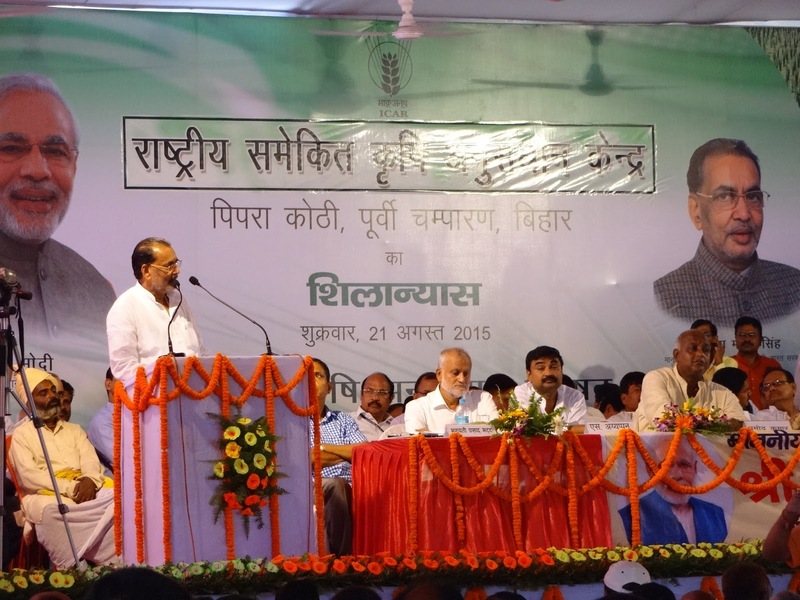 “Use flood- and drought-tolerant rice to get maximum profit from your small landholdings in the stress-prone areas of Bihar.” This was the key message of Radha Mohan Singh, Union Minister for Agriculture and Farmers Welfare, to a gathering of more than a thousand farmers during a foundation ceremony of the National Integrated Agriculture Research Centre (Rastriya Samekit Krishi Anushandan Kendra), Motihari, Bihar, India on 21 August. Minister Singh’s speech centered on stress-tolerant rice varieties (STRVs) and how it could help farmers improve land productivity. The Stress-Tolerant Rice for Africa and South Asia (STRASA) project has been developing improved rice varieties that can survive flooding, drought, salinity, and toxicity for dissemination in areas affected by such unfavorable conditions. The agriculture minister told the farmers of how scientists from the Indian Council of Agricultural Research (ICAR) took him to a pond planted with a new flood-tolerant rice variety that was fully submerged in water for 15 days. “I immediately asked them: ‘Why this much water? Wouldn’t the rice rot?’,” he related. He shared that the crop variety that survived 15 days of full submergence had “very good yield” and proudly announced that the seeds of such a variety are available for farmers in Motihari. There were also trials conducted in several villages in Motihari for the drought-tolerant variety Sahbagi dhan. 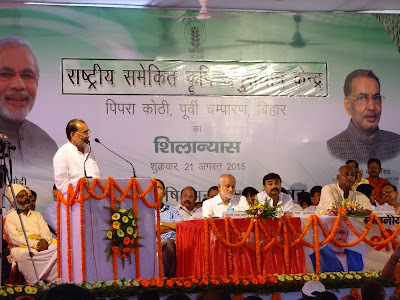 In the same event, 10 progressive farmers from the Motihari district were honored by Minister Singh for adopting improved agricultural technologies. Four of these farmers went through demonstration trials and received training on STRV management options via the STRASA and the Improved Rice-Based Rainfed Agricultural Systems in Bihar projects. “Following the Minister’s speech, the IRRI booth received a rush of inquiries from farmers,” said Dr. Sudhanshu Singh, IRRI scientist and rainfed-lowland agronomist for South Asia, who represented the Institute during the foundation ceremony and exhibit. Top officials from ICAR, including Director General Dr. S. Ayappan, and its institutes were present in the ceremony.